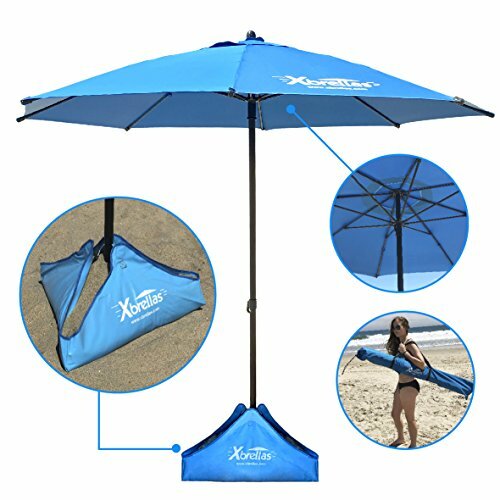 Finally the Xbrella gives you the best opportunity to enjoy good, consistent shade at the beach without the fear and worry of your umbrella falling over. Days at the beach are a time to relax and take a break from the stresses of life. Xbrella gives you the comfort to know that you can have an enjoyable day at the beach. The patent pending sand fill system is designed to be lightweight, easy to set-up and take down. Set-up takes less than 5 minutes and take down is 2 minutes or less. The Xbrella is wind resistant, heavy duty and windproof. Includes sand anchor to easily put down into the sand. Heavy Duty Beach Umbrella - Our Xbrella design umbrella is good for those windy days at the beach. The Sand Fill system keeps the umbrella from falling over in winds up to 40+ MPH. Strong Fiberglass Ribs are used in the construction of the umbrella for a strong firm umbrella. Sand Base System- The key to the Xbrella is the sand base system. The pole goes into the sand about 1 foot and then the sand in the base adds another foot so the umbrella is in 2 feet of sand. When the bag is filled with sand it weighs over 125 pounds. Easy to set up with the included shovel and take down by just removing the umbrella pole and lifting the sand bag to empty the sand. Patent Pending - This unique design of the Xbrella has been tested and proven to be the best high wind beach umbrella. Our unique design is so creative we have a patent pending with the USPTO. Please note we enforce our patents in a strong manner to protect our rights. Our system has hooks sewn with webbing onto the flaps that clip to pole through holes in the pole. No grommets, No bolts, No threaded collar & No sliding collar. 100% SATISFACTION GUARANTEED - We are so confident that you will like our tomato cages that if you return it within 30 days for any reason we will give you a full refund on the product price. Try it, we know you'll like it!